BANGALORE – Sri Lanka’s Muslim community is insecure and angry. 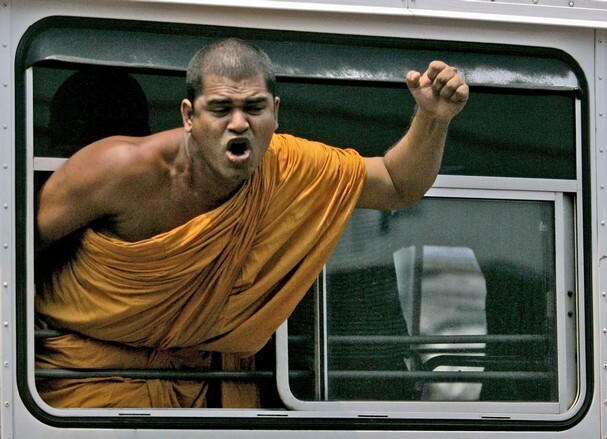 A mosque in the central town of Dambulla was attacked with petrol bombs and vandalized around 10 days ago by a mob led by radical Buddhist monks. To add insult to injury, the government has bowed to the mob’s demand and ordered the mosque’s demolition and relocation. Muslims say the mosque is about 60 years old. The monks insist it was built after 1982 when the government declared the area to be a “Buddhist sacred area”. They allege that the mosque is an “illegal structure”. They have threatened to demolish the mosque if the government doesn’t relocate it. Within days of the violence and the warning, Prime Minister Disanayaka Mudiyanselage Jayaratne, who also heads the Ministry of Buddhist Sasana and Religious Affairs, announced the mosque’s relocation. Muslims have been “offered the choice of three alternate locations” to relocate the mosque, he said, adding that “steps are being taken to immediately shift the mosque”. Muslim leaders have rejected the offer. “We will not agree to any compromise of taking land elsewhere,” Sri Lanka Muslim Congress leader and Justice Minister Rauf Hakeem told reporters in Colombo. The SLMC is part of the ruling United People’s Freedom Alliance. “There are 72 unauthorized constructions near the Dambulla Buddhist temple, including the mosque and a kovil [a Hindu temple in Tamil], which will be removed within six months,” a monk from Dambulla is reported to have said. Buddhism is the religion of the majority of Sri Lankans. It is estimated that around 70% of the island’s population are Buddhist. Almost all Buddhists are Sinhalese. The religious minorities include Hindus (15%), who are mainly Tamil speaking, and Muslims (7.5%) and Christians (7.5%). The Sinhala-Buddhists’ self-perception has three components. The first is that they belong to the “Aryan Sinhala race” (as distinct from the Tamil Dravidians) and that Sri Lanka is their homeland; the second is that they are defenders of the Buddhist faith, the mission of protecting Buddhism having been entrusted to them by Buddha himself; and the third is that Sri Lanka is the home for the Sinhala language. This self-perception has created a virulent form of Sinhala-Buddhist supremacism. Now, this is a truly rich irony. Recall that it was the Hindu deity Ram (Rama) whose mythology was at issue in the Ayodhya controversy. In the Hindu epic the Ramayana, Rama is incarnate on earth (an avatar of the greater deity Vishnu), a prince of Ayodhya in northern India, who makes war on Lanka (contemporary Sri Lanka) to win back his captive wife Sita who had been abducted there by the island’s demon king Ravana. This story is believed to have roots in the exploits of a culture hero who carried the Aryan civilization south, conquering the Dravidian peoples who were represented in the epic as “demons.” Contemporary Hindu militants are also making a claim to another key site in the story—the purported remains of the Ram Setu land bridge linking India and Sri Lanka, said to have been built by Rama’s invading armies. Sinhalese-Buddhist supremacists draw on the Mahavamsa, first written in the sixth century AD and revised thereafter in the 16th, 17th and 18th centuries to justify Buddhism’s dominance in Sri Lanka and to bolster claims that the country is and has to be a Sinhala-Buddhist state. Much in the Mahavamsa consists of myths, but to many Sinhalese it is irrefutable history. It has created what is often described as the Mahavamsa mindset, a belief that Sri Lanka is a Sinhala-Buddhist land because the Mahavamsa says so. The Mahavamsa mindset lies at the core of Sinhala-Buddhist hardline arguments that the island is “theirs” and religious and ethnic minorities are “guests”, who stay in Sri Lanka on the sufferance of the Sinhalese-Buddhists. Their continued stay here is on the condition of “good behavior”. As former chief of army staff, Lieutenant General Sarath Fonseka, once said in an interview, the minorities must not “demand undue things”. Get it? The Sinhalese are “sons of the soil,” while the Muslims are “alien” and even “Shylockian.” Does this sound familiar? Inflammatory writing in publications Dharmapala’s Sinhala Bauddhaya and Piyadasa Sirisena’s Sinhala Jathiya fueled anti-Muslim sentiment in the island and is believed to have culminated in the anti-Muslim riots that year. The end of the civil war and the defeat of the Liberation Tigers of Tamil Eelam in 2009 triggered a tidal wave of Sinhalese-Buddhist triumphalism…. In the war-ravaged, Tamil-dominated Northern province this muscular assertion of the Sinhala Buddhist identity has manifested itself not only in increasing Sinhalization of signboards and village and street names but in a proliferation of Buddha statues and Buddhist temples. A recent report by International Crisis Group (ICG) says that Buddhist temples are coming up near military installations but also “without permission on private land”. “New constructions” are coming up over destroyed Hindu temples. “There are also fears,” the ICG report says, “that the government’s archaeological department, long under the influence of Sinhalese nationalists and heavily lobbied by influential Buddhist groups, would use ‘discovered’ ancient Buddhist sites in the north” to build new Buddhist temples there. The underlying issues and context of the attacks on the Dambulla mosque and the Babri masjid are not identical. The mobilization in Dambulla was local, unlike the country-wide campaign that preceded the Babri masjid’s demolition. Still, Sri Lankans should be worried. The hate rhetoric articulated by the radical monks is uncannily similar to that mouthed by India’s proponents of Hindutva. The Dambulla incident could unleash emotions and events with far more serious consequences. Divisions along caste and linguistic lines have defeated somewhat the Hindutva (literally Hinduness, an exclusivist ideology that aims at making India Hindu) agenda of India’s Hindu nationalists and extremists. Definitely one to watch, and we wish this ugly affair had won more international coverage. That lovely reference to “Shylockian” Muslims is further evidence that, as we have long contended, anti-Semitism and Islamophobia are genetically linked phenomenon. This should give pause to Zionists who support Israel’s own political archaeology at the Temple Mount and Jewish holy sites on the West Bank. Not that we are holding our breath. A catastrophic disaster is in Horizon, unless all wise intellectuals peace loving people get together and avoid it at their earliest before things get out of hand. How Fasism came into being? Is politicial phonomena,origin and grow in Europe after first world war.1929 great deprssion in Eurpoe and US fasiam give birth to Germany and Italy And Japan in east.In politicial term was most ruthlees state ,supressed, orininary people but target on cetian groupe of community who, had been controal sensetive part of Economy in Germany.Its bases on rasism fundamantly opposed communism and socilaism of Soviet Union excistance.Hilter was pillar and politicial leader and Mossulina of Italy was his main follower. Its ground reality and mode of operadi was Roman Catholic and Protestant Church in Germany the Christian theology.Some are supports on Martain Lutheran’s followers of Protestant church in Germany . 2 Politiaclly Ruthless Capitalism /Imperlism to expansion plundering and colonozed Asia Africa and other underdeveloped countries are root cause of origin and developement of Fascim. 3 In Germany it was Jews discramantion of So-called Germnay Ariyans of myth of Hilter. 4 Teaching of religon belived God is great ,God Creat man and world was base of Chritinisty of Nazism and Fascism Geramy and Italy. Sri Lankna was buddhist country maily since 2600 years,Buddhism came to island from India.Until now Buddhism is main religion and culture of people of Sri Lanka.Buddhism has NO RELATION WITH FASCISM,and TEACHING OF BUDDHIST Theory OF KNOWLEGDE IS NON -VIOLENT.Mathama Gandi follow of Non -Violance policy is Buddhist teaching in India as well. Asain country like Sri Lankan ever-never allow FACISM rise head be part of thier culture.And No any Buddhist Priest or Monk in history of Sri lanka try convert any person by force from other relgion.That is nutshell of history of Buddhism in Sri Lanka. Buddhist did not have such pratice like other religion as Christen and Muslim by force convert others into their religion. Your text of letter approch reading of Buddhism of worng concept of Sri Lankan Buddhism. Sri Lanakn politics and religion of Buddhism are two differant phonomena. Sri lanka is third world country,our economy-politcial system is weak and still lower stage of capitalism;we have no way to pratice Fascism in politics any government will come to power.We are one of Asian country elecated RULERS BY BALLOT.Our (sri lankan) sovereginity and strategic of politics are base on UNITED and DIVERSITY of secular democarcy order.And accpect all FREE RELIGION PRATICE ever nook and cornor of the island. Buddhist teachings are spiritually so great but in today what is happening in Sri Lanka????. 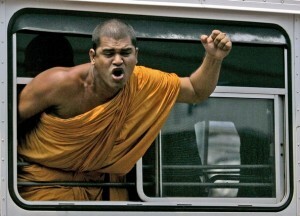 Buddhism it has become a institutionalised in Sri Lankan context. On the other hand , buddhism and its followers has become a best way for the politiceans regarding achive to . What Buddha gave us that is to follow a moddle way on the social life but what is happening among majoeity buddhist monk and politiceans and people in Sri Lanka. Sri Lanka is a Buddhist Country and Buddism is the culture of Sri Lanka is the matter of serious question. Lord Buddha even appears now, never accept this notation. Every single true Buddhist in Sri Lanka or elsewhere in the world respect Muslims and every true Muslims respect Buddhist is the undeniable fact. Buddhism; does it mean statue of Buddha and Stupas (Buddhist temples) or is it its doctrines. Anyone who lands in Bandaranaka Air port and travels from where to Ambantota/Katharagam (far south of the Island) never feel glimpse of Buddhism except the Monks with yellow rob, the Buddha statue and stupas. The entire Sri Lankan culture is full of paganism, rationalism, witchcraft, alcoholism, prostitution, Killing, slandering, steeling etc etc. None of these are neither recommended nor taught by Lord Buddha. Whoever knows Buddhism and read the books of Buddhism (Tipitaka) never accept that Sri Lanka has a Buddhist culture. What the monks do now is to worsen the situation that is to wipe out the Buddhism by showing to the world their fascism instead of spreading the Buddhist doctrines. Should this fascism continues, there is no doubt that Buddhism will be wiped out of the Sri Lankan Island very soon. Buddha never spread his philosophy by force and fascism but by teaching and patient that spread his philosophy all over the World. By logic the opposite will generate the opposite reaction. firdhousr’s comment is 100% correct. Today sri lankan Buddhists are only talking and boosting about their religion, but not practicing. What a sad situation. The entire Sri Lankan culture is full of paganism, rationalism, witchcraft, alcoholism, prostitution, Killing, slandering, steeling etc etc. None of these are neither recommended nor taught by Lord Buddha. Which part of Ramayana did you read describes Rama as Aryan Civilization God conquering Dravidian People who were represented in the epic as “Demons”? Can you please quote me the references and it appears you are cleary “MISLEADING” people in the name of Journalism. I would stand corrected if you give me the references.